In late 1875, Sioux and Cheyenne Indians defiantly left their reservations, outraged over the continued intrusions of whites into their sacred lands in the Black Hills. They gathered in Montana with the great warrior Sitting Bull to fight for their lands. The following spring, two victories over the US Cavalry emboldened them to fight on in the summer of 1876. To force the large Indian army back to the reservations, the Army dispatched three columns to attack in coordinated fashion, one of which contained Lt. Colonel George Custer and the Seventh Cavalry. 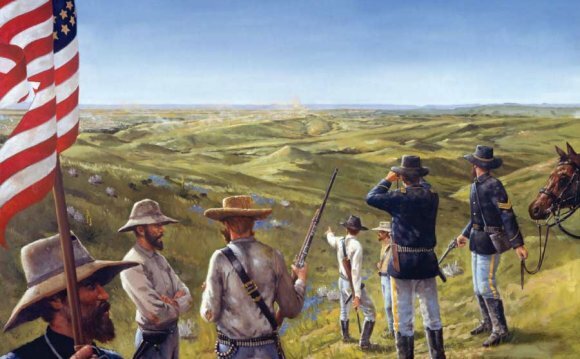 Spotting the Sioux village about fifteen miles away along the Rosebud River on June 25, Custer also found a nearby group of about forty warriors. Ignoring orders to wait, he decided to attack before they could alert the main party. He did not realize that the number of warriors in the village numbered three times his strength. Dividing his forces in three, Custer sent troops under Captain Frederick Benteen to prevent their escape through the upper valley of the Little Bighorn River. Major Marcus Reno was to pursue the group, cross the river, and charge the Indian village in a coordinated effort with the remaining troops under his command. He hoped to strike the Indian encampment at the northern and southern ends simultaneously, but made this decision without knowing what kind of terrain he would have to cross before making his assault. He belatedly discovered that he would have to negotiate a maze of bluffs and ravines to attack. Reno's squadron of 175 soldiers attacked the southern end. Quickly finding themselves in a desperate battle with little hope of any relief, Reno halted his charging men before they could be trapped, fought for ten minutes in dismounted formation, and then withdrew into the timber and brush along the river. When that position proved indefensible, they retreated uphill to the bluffs east of the river, pursued hotly by a mix of Cheyenne and Sioux. Just as they finished driving the soldiers out, the Indians found roughly 210 of Custer's men coming towards the other end of the village, taking the pressure off of Reno's men. Cheyenne and Hunkpapa Sioux together crossed the river and slammed into the advancing soldiers, forcing them back to a long high ridge to the north. Meanwhile, another force, largely Oglala Sioux under Crazy Horse's command, swiftly moved downstream and then doubled back in a sweeping arc, enveloping Custer and his men in a pincer move. They began pouring in gunfire and arrows. As the Indians closed in, Custer ordered his men to shoot their horses and stack the carcasses to form a wall, but they provided little protection against bullets. In less than an hour, Custer and his men were killed in the worst American military disaster ever. After another day's fighting, Reno and Benteen's now united forces escaped when the Indians broke off the fight. They had learned that the other two columns of soldiers were coming towards them, so they fled. After the battle, the Indians came through and stripped the bodies and mutilated all the uniformed soldiers, believing that the soul of a mutilated body would be forced to walk the earth for all eternity and could not ascend to heaven. Inexplicably, they stripped Custer's body and cleaned it, but did not scalp or mutilate it. He had been wearing buckskins instead of a blue uniform, and some believe that the Indians thought he was not a soldier and so, thinking he was an innocent, left him alone. Because his hair was cut short for battle, others think that he did not have enough hair to allow for a very good scalping. Immediately after the battle, the myth emerged that they left him alone out of respect for his fighting ability, but few participating Indians knew who he was to have been so respectful. To this day, no one knows the real reason. Little Bighorn was the pinnacle of the Indians' power. They had achieved their greatest victory yet, but soon their tenuous union fell apart in the face of the white onslaught. Outraged over the death of a popular Civil War hero on the eve of the Centennial, the nation demanded and received harsh retribution. The Black Hills dispute was quickly settled by redrawing the boundary lines, placing the Black Hills outside the reservation and open to white settlement. Within a year, the Sioux nation was defeated and broken. "Custer's Last Stand" was their last stand as well. "Reno took a steady gallop down the creek bottom three miles where it emptied into the Little Horn, and found a natural ford across the Little Horn River. He started to cross, when the scouts came back and called out to him to hold on, that the Sioux were coming in large numbers to meet him. He crossed over, however, formed his companies on the prairie in line of battle, and moved forward at a trot but soon took a gallop. "The Valley was about three fourth of a mile wide, on the left a line of low, round hills, and on the right the river bottom covered with a growth of cottonwood trees and bushes. After scattering shots were fired from the hills and a few from the river bottom and Reno's skirmishers returned the shots. "He advanced about a mile from the ford to a line of timber on the right and dismounted his men to fight on foot. The horses were sent into the timber, and the men forward on the prairie and advanced toward the Indians. The Indians, mounted on ponies, came across the prairie and opened a heavy fire on the soldiers. After skirmishing for a few minutes Reno fell back to his horses in the timber. The Indians moved to his left and rear, evidently with the intention of cutting him off from the ford. Henry Rinaldo Porter (February 3, 1848 – March 3, 1903) was an Acting Assistant Surgeon in the 7th U.S. Cavalry at the Battle of the Little Big Horn.